Update: I do talk about brands in this post but not for advertisement (5 people are following this blog so far…). I just enjoyed those products and someone else might enjoy them too. 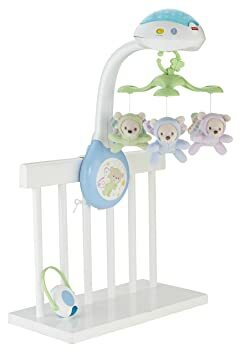 I wanted to give my opinion on baby toys for those, like me 5 months ago, who have no idea what is necessary (helpful at least) or if everything is superficial. From my (little) experience, before 3 months, they need absolutely no toy. The first months they don’t see well and they already have so much to look around although they are much more interested in faces. *As a present, I got that one from Fisher Price, and I used it a lot during the first 2-3 months, I am not an expert but it really had the power to relax him and to help him fall asleep when he was a newborn, so I’m very thankful for that. Then they start to be more curious and they need to explore things with their mouth. So it’s nice to make them try different texture. It can be a a soft toy (like a small teddy bear), a rattle but for me (and many other mums I know) their favourite “toy” is a small blanket. My lobster was born in Winter and by chance family and friends gave me two very soft baby blanket. It was perfect to cover him at first and to use one while washing the other one. I also bought cotton muslin squares (sooo soft) when he was born that I started to use only a month or so ago. Now that the weather is warmer they are perfect, he can play with it, chew it, cover his face, we play peek-a-boo with it and he often falls asleep playing with it. And then, you might want one or two little books (the ones they can chew on without destroying it) because they say it’s important starting to read and count for them. He does have a few more things that people gave him but those above are his (well, my) essentials. And for now that’s it! I will update this post later on during the next months to let you know what can be useful. I do think less is better and I’m a big fan of DIY – I’m already planning on making him a treasure chest :) – so let’s see!